Drake’s is one of my favorite menswear brands. The label has come a long way from its humble beginnings as a purveyor of men’s scarves and later, ties and pocket squares. Today, Drake’s is a full fledge haberdashery and carries its own line of suits, shirts, jeans, and even shoes. Drake’s expertly showcases their menswear offerings in their seasonal lookbooks. These lookbooks always fill me with a sense of longing, similar to how a child browses through a toy catalog. It’s not hard to fantasize how good you might look if you owned a linen field jacket or tweed sports coat. However, one obstacle I always face is knowing how these clothes will fit me. If I were in London, I could easily spend an afternoon trying things on in Clifford St. and then hitting the pub afterwards. Unfortunately, the only Drake’s retail location in the United States is in New York. It seems like my only option would be to order things online, try them on, and then send them back if they didn’t fit, is not the optimal customer experience. Cable Car Clothiers in San Francisco has put an end to that. The historic menswear store on the corner of Sutter and Montgomery streets has always carried a treasure trove of quality menswear goods like Filson, Lock & Co., and Fox Umbrellas. And now, Cable Car has added Drake’s to that list. Cable Car Clothiers not only carries a wide selection of Drake’s accessories, but they also have a full section of suits, knitwear, jeans, and outerwear. 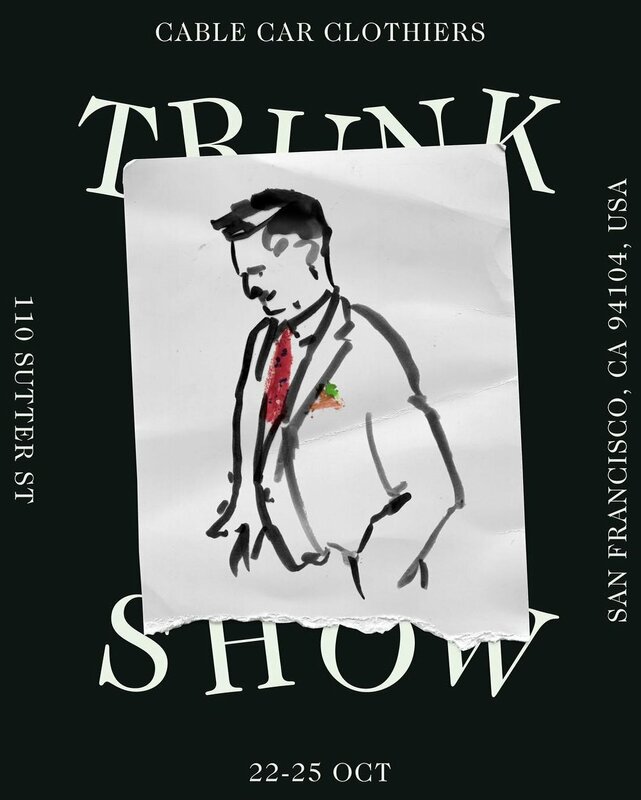 In addition, Cable Car Clothiers hosts Trunk Shows on a frequent basis where new inventory is brought in and customers have the ability to order made-to-order garments and ties. I swung by the latest trunk show and met Matt Woodruff, the manager of Drake’s New York store. Matt brought with him a fantastic selection of Drake’s current fall offerings including velvety corduroy suits, luxurious shaw collars, and a spectacular blanket coat. Not to be one who shows up empty handed, I made sure to bring some local Drake’s beer to be shared among the guests who showed up. Matt was incredibly helpful in helping me try on some garments. I also watched as helped other customers select fabrics for MTO ties and jackets. I found a few things I really enjoyed including some shirts and their shirt jacket, which feels like the perfect garment for Bay Area summers. Everything at the Trunk Show will stay with Cable Car until the next time Matt comes into town. If you’re interested in seeing some of Drake’s stuff in person, I’d recommend stopping by. If you’re not in San Francisco, you still might be in luck. Drake’s has been offering trunk shows in a variety of cities across the country including Pasdaena, Raleigh, and Mountain Brook. Keep an eye on their Instagram and maybe they’ll show up near you.